Happy New Year to you and yours! May blessings abound in your life in the coming year. I’m going to be hosting the attached Art & Wine Party to benefit my daughter’s school and I’d love to have you join us! This party will be promoted and spaces sold at the school’s annual gala next Saturday evening (2/2/19.) There are only 10 seats available for it, and we do expect it to sell out. I wanted to offer you a pre-invitation before that. Please let me know if you’d like me to sign you up, or you can just use the link provided on the attached flyer to sign yourself up. (It’s the second party on their offerings page.) Your support is really appreciated, so thank you very much! We’ll begin with wine and cheese at 4:00 p.m. then I’ll speak about my journey as an artist, as well as the process and stories embedded in the works. You’re also invited to join us for dinner afterward at Mio Bistrock at 5:00 p.m. to continue the discussion. Please RSVP to Susan@glittergypsy.com and feel free to invite your art-loving friends. Opening Today! 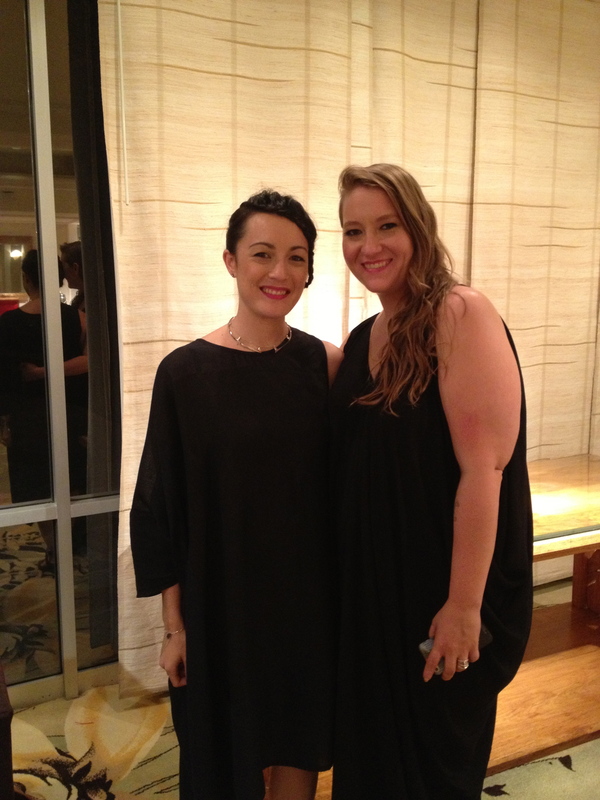 Gallery Show & Artist Residency. La Huipilista Artspace, San Miguel de Allende, Mexico, is presenting an exhibition of my recent and current work titled “Portals to the Soul.” You are cordially invited to join us as we open the exhibit on Friday, October 12 from 5 to 7 pm. My approach to art is deeply connected to the expression of the divine feminine, psycho-spiritual studies and Intentional Creativity. The dynamic approaches I use, such as art therapy, dream work, shadow and depth work are based on my ability to access the deeper realms of personal and universal healing. With this interactive installation, “Love Letters to the Children and Families” I am inviting visitors to share comments, wishes and letters for those currently impacted by the U.S. administration’s border separation policy. It is my intention is to create a collective field that supports and holds these families energetically in the arms of the Divine Mother. Please feel free to create your own wishes with us. You can submit then here in the comments field and I will print them for adding to the grid in the gallery window. “Portals to the Soul” continues though November 3rd. Aloha Friends and Fellow Goddesses! Looking for an adventure? Tired of the same-ol’-same-ol’? Feeling like you’ve lost your spark? Needing a kick-start to access your divine goddess energy and creativity? Then I’ve got just the right medicine for you! 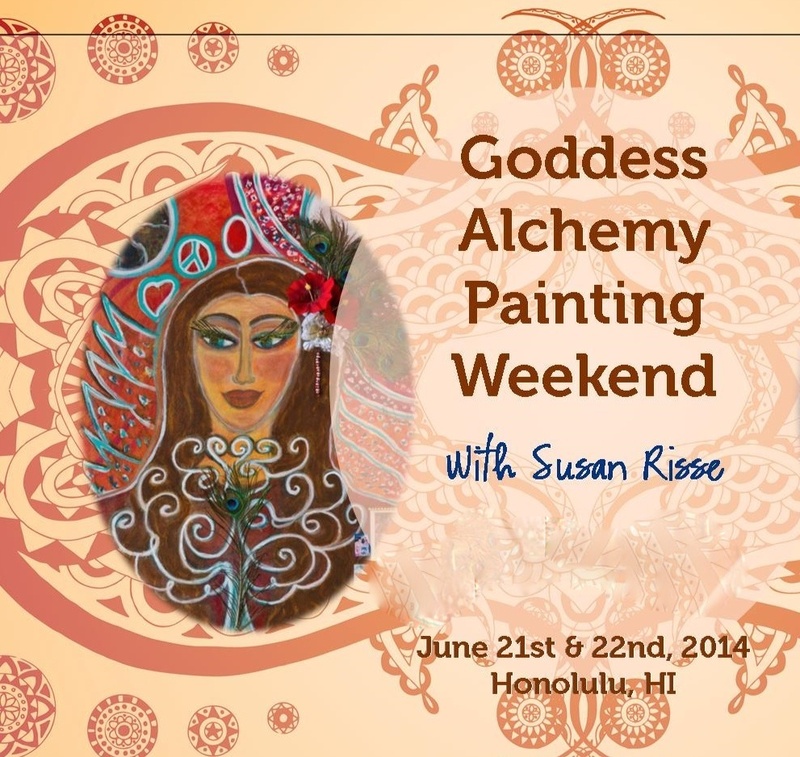 You are cordially invited to “The Goddess Alchemy Painting Retreat,” a very exciting and empowering painting weekend. 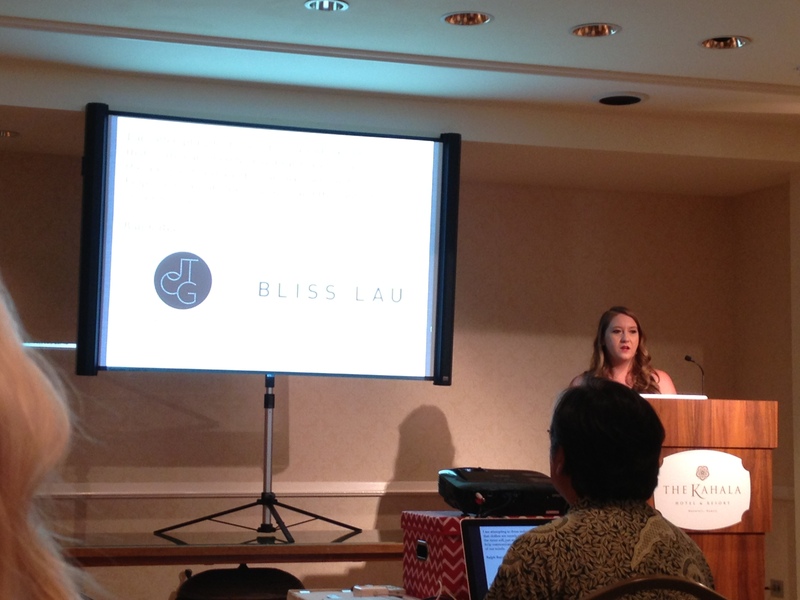 It’s happening here at Glitter Gypsy Studio, in gorgeous Honolulu, Hawaii. Over this momentous weekend together, we’ll journey into the very depths of your soul’s innate wisdom, allowing you to discover and then create your own Goddess Icon. You’ll be welcomed into a serene and peaceful environment, promoting sharing, ritual and a community atmosphere. No painting experience is required, just a desire in your heart to connect with your Divine Feminine Self through creativity. Throughout this inspirational experience, using Intentional Creativity, you won’t have to worry about a thing. I’ll be guiding you through a simple step-by-step process. As your journey progresses, you’ll become enlightened, allowing your insight to guide you in creating your own “Goddess Icon.” When you leave with ‘Her,’ you’ll continue to feel the essence of the energy and intention that you’ve put into Her & she will continue to bless and inform you. I welcome this opportunity to get to know you better and would absolutely LOVE to inspire and create with you! A light lunch, healthy snacks & beverages are included. You’re also welcome to bring something for our snack bar, if you’d like, but don’t feel obligated. This retreat will be taking place June 21st-22nd from 11am-4:30pm. Claim your spot now, as this intimate event has limited spaces. It’s easy to sign up– just click on the”Buy Now” button below and we’ll see you here! Special Goddess Promotion price ONLY $199 materials included! ONLY a $50 deposit to Make a Reservation**. It’s time to put yourself first and shed those old stories. Let’s uncover the REAL YOU again! Web Site: Glitter Gypsy’s Adventures. **Non-refundable deposit, with balance of $149 due by June 20,2014. 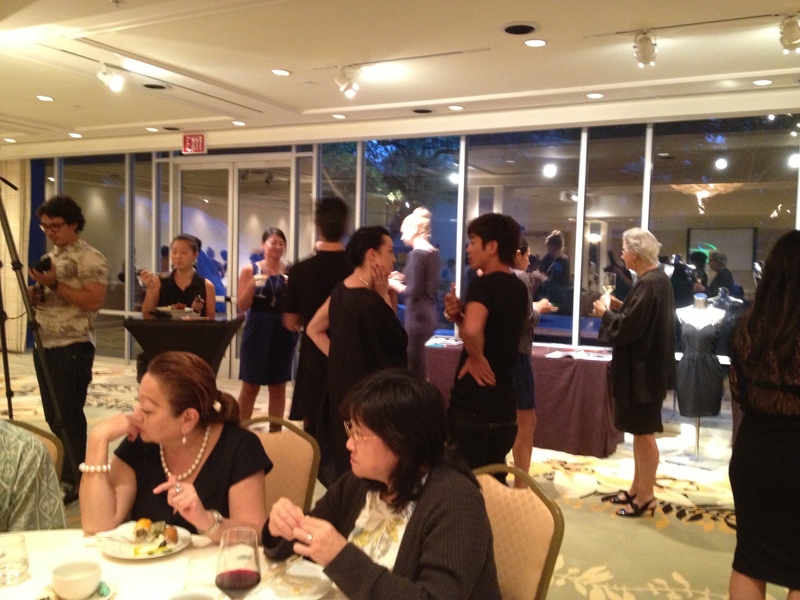 What an amazing event at the Kahala Resort in Honolulu, HI that I attended on Saturday. Professors Bliss Lau (Designer) & Jasmine Takanikos (Branding Strategist)from Parsons The New School of Design in NYC held a Master Class & Networking Workshop full of incredible information for creative entrepreneurs. Such a rare chance to learn from such successful leaders in their respective fields.I’m always eager to learn new information & new ways approaching business. Women’s Creative Spirituality Workshop. Build your own Traveling Shrine or Altar! 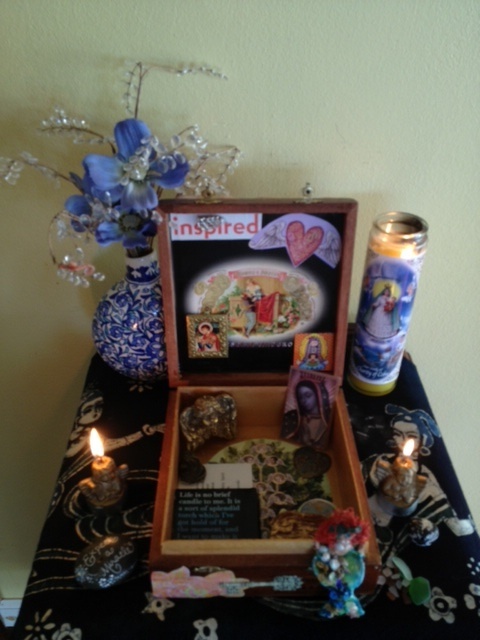 Join local artist, teacher & spiritual guidess, Susan Conrad Risse as she walks you, step-by-step, in the creation of a traveling shrine or altar dedicated to honoring your sacred self. Come just as you are, straight from work or wherever, to play with us in this magical, whimsical & sacred playground of the heart. All are welcome, no matter what you feel your “creative level” is. NO PREVIOUS ART EXPERIENCE is required. Included will be yummy food & drinks and ALL supplies. If you have totems or elements of significance to you in this creation, please bring them along! We will begin by gathering in circle to connect & ground with one another, as well as to visualize & set our intention for our evening journey. We’ll then gather our containers, personal items that you’ve brought plus anything that speaks to you from my personal ‘stash’ & begin creating! I promise that you will not only open up your heart & have fun, but you’ll also leave with something that you’ve lovingly created. – Sound good? Save your spot now for just a $20.00 non-refundable deposit. Remaining $30.00 balance to be paid by June 14th. ($50.00 total) Deposit through Paypal to susan@risse.com or drop off your deposit at the cafe to save your seat. 1.) A place or object hallowed from its history or associations; as a shrine of art. 2.) A case, box or receptacle, especially one in which one deposits sacred relics. 3.) Ritual Altar: An altar that contains objects placed for specific intent which have deliberate symbolism. 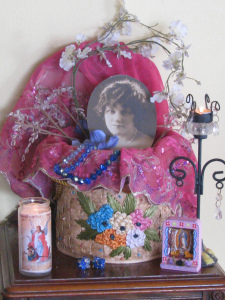 An altar created thoughtfully enhances the ritual’s meaning for the individual or group.